The Dublin based content creation, VFX, audio and post-production company, in business for over 40 years and synonymous with TV dramas such as Love/Hate, filmmakers Neil Jordan and Jim Sheridan, iconic advertising campaigns & of course U2 in their early days, announced the news as part of a refresh of the business which also appointed a new executive management board in January of this year. range of successful growth companies, including VoxPro, will bring invaluable knowledge and knowhow to our management team",, said CEO, Dave Quinn. "I'm very excited to be joining Windmill as Chairman and becoming part of such a multi-talented and dynamic team, and in particular one that is continuously pushing the boundaries of creativity in this ever changing industry", commented Mr. Binchy. Since its inception, Windmill Lane has earned an international reputation for delivering premium quality work with its unique mix of creative talent and post-production offerings that span editing, audio, animation, motion graphics, visual effects, colour and delivery management. This combination of capability, ingenuity and dependability has consistently attracted world class film makers and creatives evident in the production values on recent projects such as “Terminal” (produced by Margot Robbie), “Maze” (starring Tom Vaughan Lawlor), “Making The Grade” (directed by Ken Wardrop), Peter Foote’s hit comedy series “Young Offenders”, audio for animated shows such as “Transformers” and “Danger Mouse” and commercials for brands including AA Ireland, Ryanair, Bord Bia, Vodafone, Dulux, Virgin, Aldi and Lidl, as well as a stunning promo for fashion designer Una Burke to launch her introduction into Selfridges UK. Work in the pipeline includes “Taken Down” (a new series from the makers of “Love Hate” and “Peaky Blinders”), Mary McGuckian’s “A Girl from Mogadishu”, John Butler’s “Papi Chulo" and Neil Jordan’s hotly anticipated forthcoming feature. 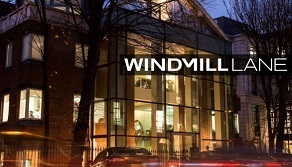 Dave Quinn added, "Windmill has a phenomenal creative history, always attracting amazing talent and clients, and with the addition of Brendan as Chairman, the new executive management board, and all the fantastic people here, it gives me much confidence for the future".